In this era when technology has become an integral part of our lives, the evolution of applications and technologies is accelerating, and access to information is facilitated by intelligent devices such as iPods, iPads, and others. Our worlds are transformed into a virtual world in which the individual lives, travels, moves, learns and studies. Virtual reality technologies have come in various ways as technologies that can be harnessed to serve the science, learners and even teachers. Virtual Reality is one of the most recently achieved techniques. In fact, it is a means of transferring the learning environment to a new and advanced level. Virtual reality technology can range from simple environments presented on a computer to multisensory environments immersed in expertise through caps, clothes and special technological devices. Virtual reality refers to a computer representation that creates a perception of the world that shows our senses similar to the real world. Through virtual reality, information and experiences can be conveyed to the mind in an attractive and more interactive way. Virtual reality can be defined as a means of interactive computer simulations that the user feels about place and action. These processes are supported by industrial feedback of one or more senses. The user feels integrated into the scene. Virtual reality modeling is the language through which 3D computer graphics are converted into virtual environments that can be viewed through multiple browsers. It is the content of a particular medium, which may be present in the real world or exist only in creative imagination and can be designed in a way that others participate in it. One of the most important elements for the success of the virtual reality experience is to indulge or dive into an alternate reality or at a certain point of view. This element emphasizes the possibility of perceiving something in addition to the world in which a person lives at a particular moment in two ways: either he or she perceives an alternative world knowing that he is living a different reality, or perceives his world in those moments from another perspective that is different from his own. Where the experience of virtual reality is a means through which we can experience the reality imagined by many of our physical senses (sight, hearing, touch) does not require the use of our imagination. In order for virtual reality to appear real, it must respond to user movements, that is, it must interact with it and thus with the user himself. There is no doubt that the presence of a computer within this system makes it necessary to achieve the desired interaction, and thus the user is also interacting with objects, characters and places in the imaginary virtual world. In which the user is imagined to actually exist in the environment of the virtual world without feeling the existence of the computer system or even the real world around him, and sees the user in this case only the virtual world, which is watching and moving in and the total sense of everything that goes on. This system is used in simulators, and in this case, the user simulates certain properties within the real reality such as the effect of gravity or particle properties, for example, or the effect of high speed on objects. Virtual reality has many benefits for the learner as it enables the technology to take a virtual tour from one place to another and the main strength of this method is that it allows users to see this place through 360 degrees and explore its elements in their three dimensions in a way that allows interacting with the scene through hot spots and this is different from just participating in Displays the information on the computer screen. It is also believed that virtual reality technology has the potential to develop student-centered self-learning by exploring a world more realistic and more interactive. The learner is able to move and navigate within the scene, which helps him to develop his ability to conceive, understand and understand the complex scientific data, which does not give the study of the dimensions of bilateral understanding required, especially in scientific materials. Second: Download the cardboard application designed for virtual reality glasses, through this application can see the content of the mobile phone in a three-dimensional way. 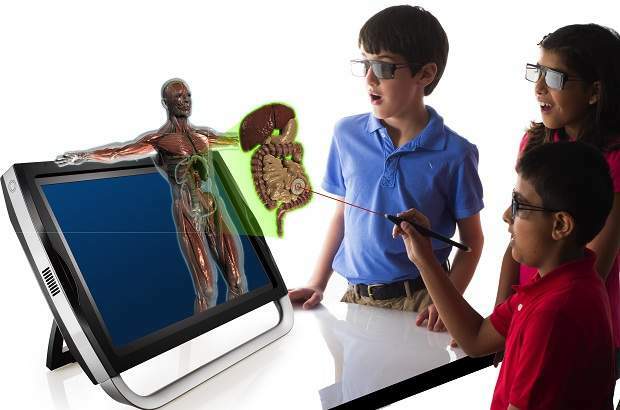 Human Body VR 3D is a great tool for biology and science teacher. It provides accurate anatomy of the skeletal, musculoskeletal, and digestive system with an explanation for each member. It supports several languages, including Arabic. Google's STREET VIEW application offers a 360-degree view of cities and streets to give the user a virtual reality of what already exists, which enables geography or history teachers to use the service to take students on a virtual tour of the world and explore civilizations and cultures.